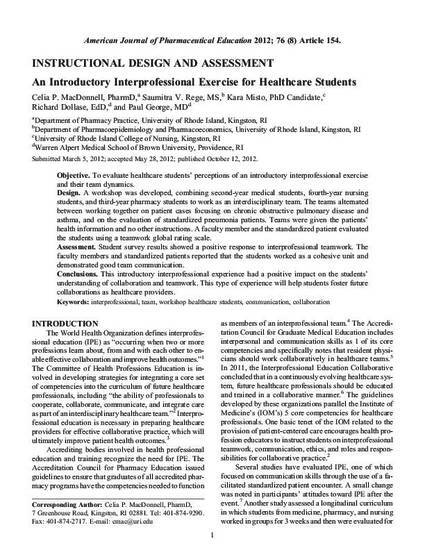 Objective: To evaluate healthcare students’ perceptions of an introductory interprofessional exercise and their team dynamics. Design: A workshop was developed, combining second-year medical students, fourth-year nursing students, and third-year pharmacy students to work as an interdisciplinary team. The teams alternated between working together on patient cases focusing on chronic obstructive pulmonary disease and asthma, and on the evaluation of standardized pneumonia patients. Teams were given the patients’ health information and no other instructions. A faculty member and the standardized patient evaluated the students using a teamwork global rating scale. Assessment: Student survey results showed a positive response to interprofessional teamwork. The faculty members and standardized patients reported that the students worked as a cohesive unit and demonstrated good team communication. Conclusions: This introductory interprofessional experience had a positive impact on the students’ understanding of collaboration and teamwork. This type of experience will help students foster future collaborations as healthcare providers.